Juneathon Day 5. My Achilles tendon has flared up again. I woke up this morning and my right Achilles tendon was tight and painful. Probably caused by a long evening out on silly, unstable high heels and last weeks increase in exercise with the Bupa 10K and Juneathon. I therefore left my Juneathon efforts until later in the day when my legs were warmed up and feeling more supple (and the fuzzy head cleared). By the time I found some clean running socks with as few holes as possible it was raining. I laced up my most comfy cushioned running shoes, told my reluctant self to go as slow as possible and selected some appropriately mellow music. A uneventlful slow plod. I didn’t have any problems holding myself back! and the rain was a refreshing change to yesterdays heat. 4.01 miles in 41.17 mins. This would have been 3.89miles, but I ran on past my house just to please the rounder-uppers of you. unfortunately I had slow reactions hence the 0.01! I’ve now done plenty of appropriate stretches and am icing my heel. Next I’m off to search through the Juneathon blogs, where I’m sure I’ve seen some useful advice on Achilles tendon treatment, to read what else is worth trying. Categories: Uncategorized | Tags: Achilles, Juneathon, Running | Permalink. Hope Achilles goes away quickly. Is there a Lego piece with bandage on foot? Ouch, hope it gets better soon! Well done for carrying on regardless. 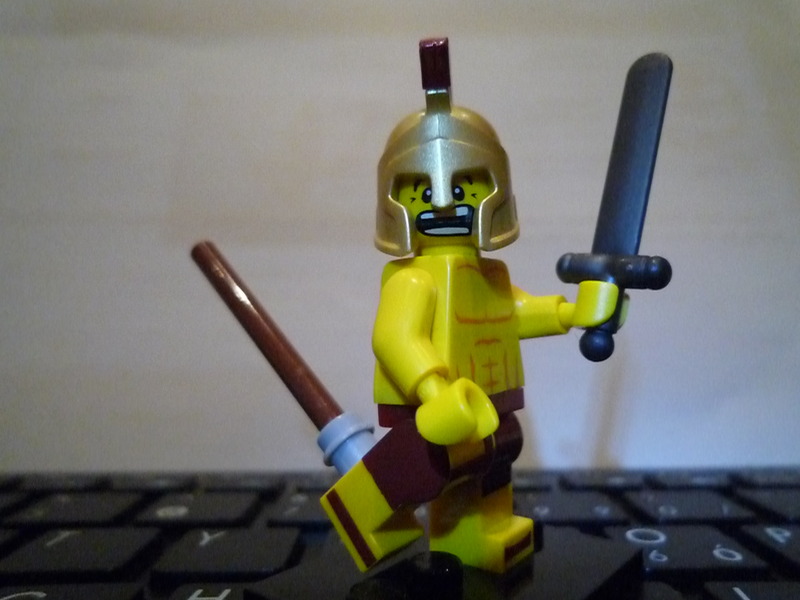 Poor achilles, great lego illustration. I hope the achilles is on the mend soon. Well done for still running, maybe try something else tomorrow tho and give it a bit of a rest…. :o) All the best, Kg. good luck, know exactly how you feel, mine has started niggling again, am sure it is all the increased activity 🙂 take it easy..
Not sure if this is any help but I was having problems with my achilles earlier on in the year March)… every time I’d run it’d be sore for a couple of days before I’d run on it and be back to square 1. I tried the Cho-Pat Achilles Tendon Strap as someone mentioned it on the Runners World forums(I think). After a week (while still running on it) my Achilles issue didn’t resurface and I was able to run without it without problems. Thanks. Worth trying, I’ll check it out.